Has someone been talking with you and you start wondering if they realize you’re not listening? Perhaps your spouse? A friend? You feel like they’re saying things that don’t make sense to you or interest you at all. You feel like you could walk away and they wouldn’t notice. Perhaps your community thinks that about your church! In the digital world it’s even easier. You’re talking on the phone and realize the line dropped several minutes ago. Or you’ve created social media posts and no one ever comments. Or you have a website and no one seems to care about all your events. What if God called you to lead a church (or direct the communications) in a specific community and you realize that most of the people aren’t connected? Is it their fault? Or are you the one who disconnected? Here are 3 signs that perhaps it’s you that disconnected from your Community. 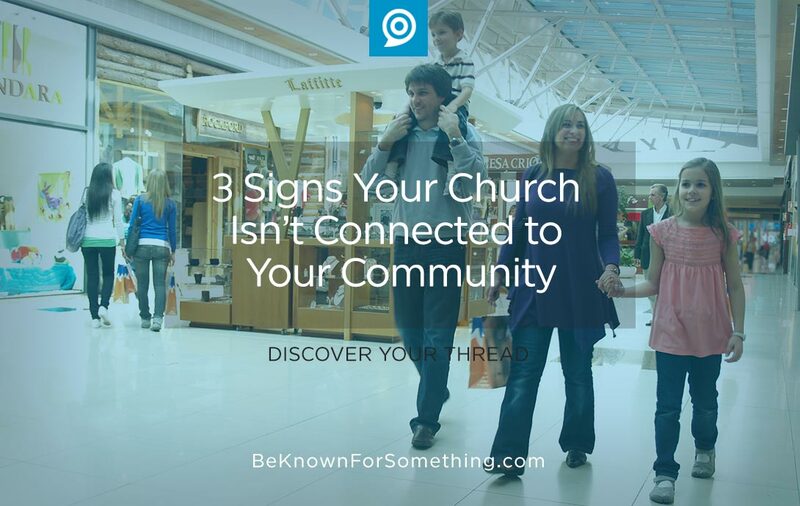 Your congregation isn’t keeping up with community growth. Over 80% of our churches aren’t growing while our communities continue to grow. Most churches are surprised with the amount of people moving into their communities every year (ask the chamber of commerce for that number). Sure, you won’t reach them all, but if you’re connecting to the new people to understand their needs, you should be growing with your community. Perhaps try loving on the new people and help them get connected to the new community. Then connect them with the Savior! Your congregation doesn’t look like your community. Have you recently walked through a public area of your community and really looked at the people? Have the demographics been shifting? More than likely, age, ethnicity, occupation, and race have changed. Now sit in your church service and assess if you look like what you saw in the community. Your community will find community with people who look like them. Do what you can to start the shift so you can reconnect with your community’s demographics. Your community stopped listening to you. If you talk to those living in the community (even close to your church), are they aware of you? Do they want to attend? Do they know specifically what you’re doing? When’s the last time they attended? Perhaps they slipped out of the conversation while you were talking over their heads. When’s the last time you truly listened to the needs in your community and engaged with them? Stop. Look. Listen. It’s the only way to have a conversation that matters (and will be listened to). It’s time to realize our churches aren’t doing what we’re called to do. We need to pay attention and reconnect to the souls in our community again. That’s why God placed you there!